Fellow perfume enthusiast Eric Hill's personal fragrance collection. How long can a bottle of perfume be stored? This is a question that we are asked quite often. It makes a lot of sense when you consider that a bottle of perfume is very often an investment. With ever-increasing bottle sizes, the question becomes ever more relevant. So how long will your new bottle of perfume last? It depends. Before we dig into this question, let’s first talk about what this question is really asking. The concern at the heart of this question is this: over time, the building blocks of a perfume can become damaged causing your favorite perfume to smell “off.” The prototypical “off” scent has been described as nail varnish or burnt sugar. This occurs gradually and if you are wearing the fragrance every day, you might not even realize that it has happened. So what causes this to happen? There are three main environmental factors that can damage fragrances: light, heat and oxygen. The first two are really easy to control. Oxygen, however, is a bit more difficult. In order to protect your fragrances, we recommend following these easy guidelines. Hold onto the box. This can make a huge difference and extend the life of your perfume a great deal. Unfortunately, most people we have spoken to recycle to box immediately after unwrapping their new purchase. Next time you buy a fragrance, hold onto the box. Storing your fragrance in its box is a great way to protect it from perfume’s number one enemy: light. Clear out a cabinet. Clear out some space in a cabinet or a dresser drawer and start storing your fragrances in a dark place. The goal here is shielding your perfumes from both natural and artificial light. If you must display your fragrances out in the open, try to choose only the perfumes that you wear regularly and stash the bottles you visit infrequently in a dark place. Keep things cool. Heat can damage your fragrances just as easily as exposure to light. A cool, climate-controlled area is ideal but if you don’t have a basement or a wine cellar, your bedroom will do. Again, the goal here is harm reduction. Some people recommend storing perfumes in your refrigerator but I personally have some issues with this approach. If you really want that level of protection, I would recommend investing in a wine cooler. Break out the gas. This is on the extreme end of things and it is not even a feasible option for most modern fragrances that come equipped clamped-on with spray atomizers but I include it here because it addresses the third and final environmental factor that can make your perfumes smell bad: oxygen. The more you use a fragrance, the more oxygen enters the bottle. Exposure to oxygen will cause a fragrance to oxidize. In order to prevent this, you can purchase a wine preserver like Private Preserve Wine Preserver. This is just a pressurized can full of a mixture of carbon dioxide, nitrogen and argon. Simply spray a bit into the bottle and then replace the stopper and instead of a pocket of oxygen your fragrance is now protected by a pocket of inert gases. As I mentioned, this is not really an option for most modern spray bottles; however, if you really want to get serious you can take a cue from the Osmothéque (the perfume museum) and transfer all of your fragrances into aluminum bottles, top them off with a bit of inert gas, seal them up and store them in your wine cooler. Obviously, most of us aren’t going to take every precaution listed above, but by implementing a few of our suggestions, you can dramatically increase the life of your fragrance. That being said, there are a few things to consider when thinking about long-term storage. The fresher the fragrance, the more fragile it is. Citrus fragrances like Annick Goutal’s Eau d’Hadrien and aquatic scents like L’Eau d’Issey by Issey Miyake are particularly vulnerable. The reason for this has to do with fragrance chemistry. Generally speaking, fresher smells are produced by smaller more delicate molecules. The smaller the molecule, the easier it is to damage. When considering long-term storage, keep this in mind. These fragrances are going to be good candidates for refrigerator or cooler storage. Top notes are the first to go. You may notice that some older bottles lack the punchy opening you may be familiar with. Heart and base notes are hardier and tend to age more gracefully. About thirty minutes after applying the fragrance, the damaged top notes should dissipate leaving behind the preserved heart and base. Hopefully, these tips will come in handy and you can pass them along to all of your friends. 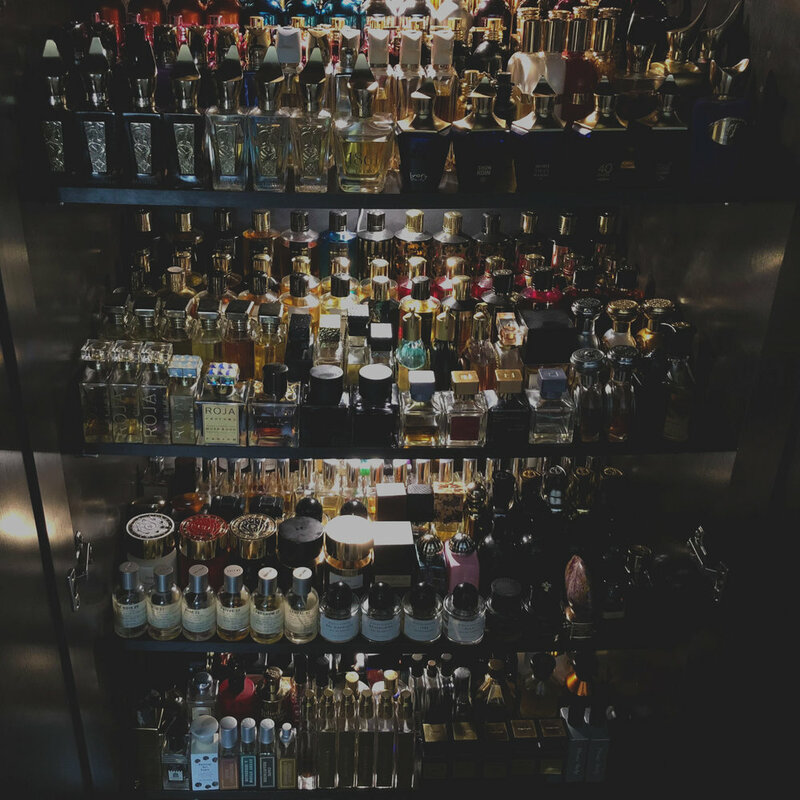 Together, we can clear up some of the misconceptions about perfume and save some perfumes from the damaging effects of light and heat in the process. We have bottles in our collections dating back to the 1920s and they still smell wonderful. There is no reason that the fragrances in your collection can’t last a decade or more if you take a few simple steps to protect them from light and heat.